Since the arrival of Alex Rider in 2000 I have seen a proliferation of books about smart, quick-thinking pre-teen boys launched into amazing action adventures. From the books of Robert Muchamore to Simon Mayo, Charlie Higson and Chris Bradford, there is no shortage of pre- and early-teen heroes combating an evil enemy. 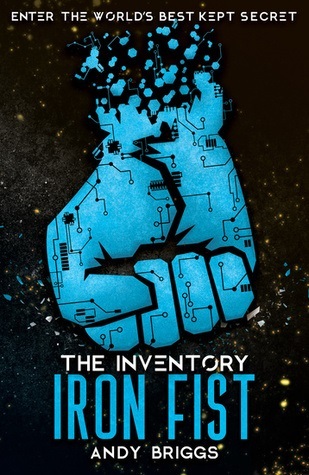 Recently arrived on my shelves are Theodore Boone, the boy lawyer from John Grisham, the Urban Outlaws, and most recently The Inventory: Iron Fist by Andy Briggs, the last of which stands apart with its fascinating array of technological and scientific gadgetry, and the number of twists, turns and surprises within. The Inventory is a collection of the most amazing technology and gadgetry (James Bond wouldn’t believe his eyes). It includes such wonders as Hoverboots, invisible camouflage and of course the Iron Fist. Dev’s uncle is the curator, backed up by artificial intelligence security. But when thieves try to breach the system and steal the Iron First, Dev is in more trouble than he realises. From the outset the gadgetry and action zing from the page. A villain who turns a police car and humans into a two-dimensional object before disintegrating them into bare molecules starts the ball rolling on page five, and is a swift example of the scintillating imagery within. This is a treat – an unputdownable action adventure that’s not dissimilar from playing a video game – except the action is in your head. I’m delighted to welcome author Andy Briggs onto the blog, so that he can relate his favourite moments in The Inventory. There is not too much I can give away as I am hoping that each layer of The Inventory is as much of a surprise to the reader as it was for me. Let me explain. Normally I feverishly plan my books chapter-by-chapter, so I know exactly where I am heading, this comes from my day-job as a screenwriter in which planning is critical. Not all authors do this and I envy those who can just simply write and a story unfolds – so for this book I dabbled in to the art of not knowing where I was going. I knew the beginning and end of course, and had a few plot points I wanted to anchor in, but I wanted the Inventory itself to feel fresh and unexplored. We’re in the town of Edderton. On the edge of town a boy called Dev lives with his uncle on a farm. Except the farm is not all it appears to be, hidden underground is a sprawling labyrinth of warehouses, hangars and passageways that make up the top secret Inventory. A place where the world’s greatest inventions are kept out of our grubby hands. Another favourite moment for me was working with the main hero of the book, Dev. Like all heroes he is forced to dig deep inside himself to figure out exactly what makes him so special. In doing so I was able to make him… give him… let him have… um, not sure how to phrase this… a unique quality that I don’t recall reading in any other book. That is a marvellous feeling, when you think you’ve got something different, a twist on the familiar that hopefully adds a little more to the story. With huge thanks to Andy. Suitable for children aged 9+ years. You can buy the book here.